"Max - you can use your energy in many different ways: you can run faster, be stronger." Another toy movie! Open Road Films has debuted the official US trailer for the Max Steel movie, adapted from one of Mattel's popular line of toys. 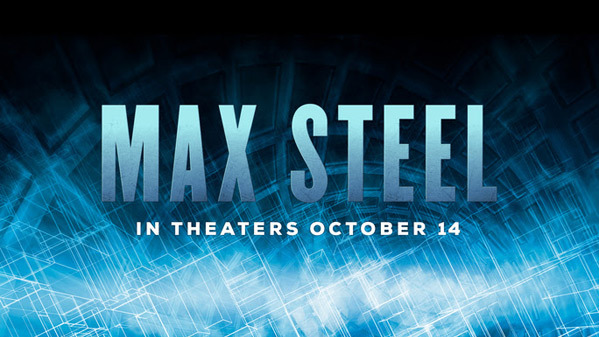 The movie is about the adventures of teenager Max McGrath, played by Ben Winchell, and his alien companion Steel - when they combine powers they become "Max Steel". The movie also features Josh Brener, Ana Villafane, Andy Garcia, Maria Bello and Mike Doyle. The villain seems to be some other weird alien force that comes after Steel and the people of Earth. This is some serious sci-fi and I'm glad they don't hold back in that aspect, but the rest of it seems a bit too cheesy for my tastes. I have no connection to the toys, but I kind of wish this looked better than it does, but alas what can you do. You can also still watch the international trailer for Max Steel here, for a different first look at this. Max Steel is directed by Stewart Hendler (Halo 4: Forward Unto Dawn) and written by Christopher Yost (Thor: The Dark World). Based on a toy and animated series, the film chronicles the adventures of 16-year old Max McGrath (Winchell) and alien companion Steel, who must harness and combine their tremendous new powers to evolve into the turbo-charged superhero Max Steel. As these two unlikely friends struggle to accept their oddly connected fates, they begin to uncover unimaginable secrets, working together to find the truth, and fighting the mysterious forces threatening their world. Open Roads Films was originally supposed to put out Max Steel sometime in 2015, but for unknown reasons it never was released last year. It's now scheduled to open in theaters starting October 14th this fall. Is anyone interested in seeing this? I'll probably wait for DVD or Netflix but I must confess to thinking that the suit looks pretty damn cool. Why is Andy Garcia speaking so deep, sounds stupid lol. Looks like something tweens and young teens will enjoy. The vfx work looks pretty great. As a casual fan of the cartoon, thanks to my son, it looks worth a viewing. pre-noon cheap show price anyways. Steel itself makes this movie look barely worth a watch. I ain't paying for it though.